By the mid 1990’s, Martin Scorsese was well into his third decade as a successful filmmaker. After a long career spent as a chronicler of inherently American stories and worldviews, Scorsese now found himself on the world stage as a major voice in international cinema. This development would explain why, sometime in the mid-90’s, Scorsese sat down to dinner with Harrison Ford, his wife Melissa Mathison, and the Dalai Lama. Mathison had written a script about the Dalai Lama’s life and his rise to prominence during a very tumultuous period in Chinese and Tibetan history, and she was convinced that Scorsese was the right person to put her vision on the screen. Scorsese was understandably skeptical— he was an asthmatic Italian Catholic kid from New York, how could be possibly be the right guy for this job? 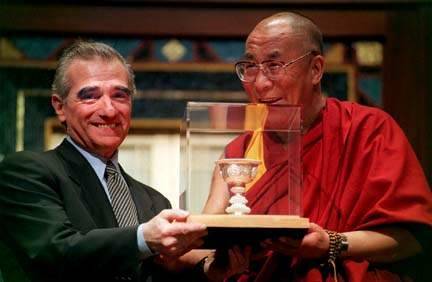 Over the course of that dinner, however, Scorsese was inspired by the Dalai Lama’s gentle courageousness and began to see the project as something of a non-denominational prayer; an act of worship that strove to connect with the shared experiences of all humanity. So it was that Scorsese teamed up once again with producing partner and ex-wife Barbara De Fina and followed up CASINO’s (1995) rollicking tale of sin and excess with a paean to peace and modesty—1997’s KUNDUN. Because Scorsese and company were not allowed to enter Tibet as a shooting locale, the production returned to Morocco—the site of filming for 1988’s THE LAST TEMPTATION OF CHRIST— as a substitute for the dramatic vistas of both Tibet and China. KUNDUN (the Dalai Lama’s alternative name and the Tibetan word for “presence”) charts the course of the Dalai Lama’s formative years during 1937-1959, a time of great social change and upheaval. Eschewing traditional narrative structure, Scorsese presents the story as an episodic tapestry: he shows us Kundun’s discovery as a baby in a village located along the Chinese border, a childhood spent grappling with his preordained fate and duties, and his rise to power as a leader of the Tibetan people. The key conflict in KUNDUN is the Dalai Lama’s struggle against the invading Communist forces, which have just emerged victorious from the Chinese Revolution and want to claim Tibet as its own while assimilating Tibetans into their atheistic culture. Kundun meets with with Chairman Mao Zedong to find a peaceful resolution, but it becomes increasingly clear that not only do the Chinese have no intention of compromise, but they also have no qualms about killing him if that’s what it takes. In order to continue leading his people, Kundun must leave his native land and secretly smuggle himself out of Tibet and into India. KUNDUN is notable within Scorsese’s body of work in that it represents a total departure from the director’s stable of regular collaborators. The cast is populated by real Tibetans—not a single American actor shows up. Tenzin Thuthob Tsarong, the real-life grandnephew to the Dalai Lama, plays his grand-uncle as a quiet, compassionate man who is resolutely steadfast in his convictions. The character is a very unconventional protagonist for Scorsese to explore—in the absence of a character arc, Kundun emerges instead as the personification of human ideals about faith and grace. Because Scorsese chooses to portray the antagonistic Chinese forces as more of an unseen force, Robert Lin downplays the role of Chairman Mao Zedong into something more resembling an effete Saturday Night Live sketch instead of a nuanced portrayal. Just as Scorsese is working with an entirely new set of faces in front of the camera, so too does he recruit a new key behind-the-scenes collaborator in the form of venerated cinematographer Roger Deakins. The first thing that strikes me about the visual presentation of KUNDUN is just how lush and gorgeous it is. The film is awash in bold, brilliant reds and yellows (and to a lesser extent, blues). Deakins’ strengths with natural light are a key factor here, but so too is Scorsese’s decision to compose his anamorphic 2.35:1 frame as if it were a Western film. Scorsese was profoundly influenced by the genre in his youth, and KUNDUN serves as a chance to emulate that style of filmmaking. As such, Scorsese often frames his subjects as small figures (on horseback too, naturally) against dramatic vistas and landscapes. The camerawork reflects this aesthetic choice, adding a sweeping sense of scope with inspired dolly, crane, and helicopter shots. Famous for his hyperkinetic camerawork, Scorsese surprisingly employs a fairly reserved sense of movement, allowing a lyrical presentation style to generate the requisite energy instead. Working once again with regular editor Thelma Schoonmaker, Scorsese departs from his blunt, rough-around-the-edges editing aesthetic. Perhaps inspired by the visual motif of colored sand arranged in intricate patterns that recurs throughout the film, Scorsese and Schoonmaker fashion a refined edit that makes extensive use of dreamlike crossfades and expressionistic cross-cutting reminiscent of the French New Wave. Combined with several slow motion shots that highlight the graceful beauty of movement, KUNDUN comes off as the most lyrical, poetic work Scorsese has ever accomplished. Revered minimalist Philip Glass provides KUNDUN’s score, rendering his signature staccato/legato hybrid style in an appropriate mix of Eastern-influenced strings, gongs, and chants. The music flows like a coursing river through Scorsese’s vignettes, connecting each moment together into the grand flow of time while giving each story beat a poignant resonance. 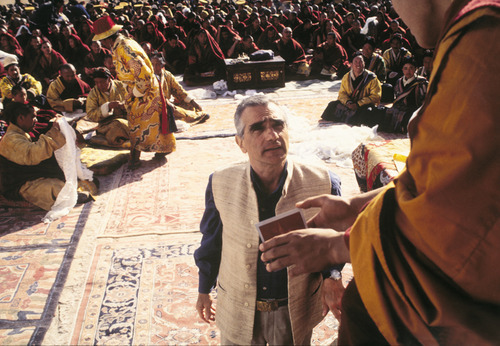 On its surface, KUNDUN seems like a film extremely disconnected from Scorsese’s body of work, to the point that Scorsese himself initially questioned why he should become involved. However, KUNDUN actually dovetails quite harmoniously with Scorsese’s career-long thematic fascinations. Grappling with religion and faith has always been an essential component of Scorsese’s work, and KUNDUN couches that search in the context of Eastern philosophies like reincarnation. Atheism is also tackled, with Chairman Mao’s line, “religion is poison”, given significant emotional weight as the yin to Kundun’s yang. KUNDUN’s dramatics hinge entirely on this dichotomy of an ancient culture clashing with the rapid modernity of the 20thcentury, or in other words, a war of the Enlightened between religion and science. The friction caused by this collision of mismatched ideals is reminiscent of Scorsese’s prior portraits of old-world Italian culture—a culture steeped in tradition and ritual—butting up against the materialistic ideals of modern America. 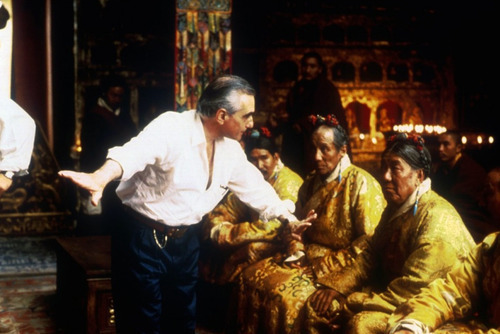 Additionally, KUNDUN contains some other surface signatures of Scorsese’s aesthetic: violence portrayed as sudden and chaotic, and cinema as part of the characters’ lives (Kundun is shown watching a silent “magic” film and old Hollywood epics). KUNDUN closes with a very notable dedication— Scorsese’s mother, Catherine, had passed away during the film’s preproduction. The director’s parents had always been an integral part of his filmmaking, even going so far as to make regular cameos, and Catherine’s passing (as well his father’s passing a few years prior) now meant that he was now truly on his own. Despite any sympathy this may engender for the director’s efforts, KUNDUN failed to find success at the box office upon release, and reviews were… polite, to put it mildly. Many critics were reverent of Scorsese’s beautiful filmmaking, but were ultimately bored by the lack of a compelling narrative. Stateside, the film was nominated for Academy Awards for its art direction, cinematography, costume design, and original score, but in Tibet and China, the film was hastily scorned (with Scorsese himself banned from ever entering China as a result of his making the film). Nearly twenty years removed from its release, KUNDUN has positioned itself as something of a companion piece to THE LAST TEMPTATION OF CHRIST. It’s an Eastern equivalent to the Western question of religion and man’s place in the grand cosmic machinery, a concept that Scorsese has struggled with throughout his whole life. While KUNDUN may be an oft-neglected work in his filmography, Scorsese’s attempts to further his own understanding of his faith from a wildly different perspective gives the final film an enduring emotional richness. KUNDUN is currently on standard definition DVD from Touchstone Pictures.